Healthy skin looks vibrant, refreshed, and young. 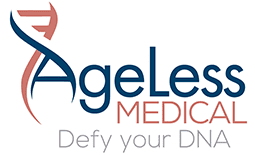 At AgeLess Medical in Cheyenne, Wyoming, advanced aesthetic specialist Jill Girany, APRN, offers ZOⓇ Skin Health products to help promote your skin’s optimal health. Call the office or book an appointment online today to take advantage of chemical peels and other ZO products that have visible results. Facial: Relaxing treatment consisting of deep cleanse and exfoliation using Invisapeel™, skin care analysis, extractions, and facial massage to stimulate blood flow. Dermaplanning: Light exfoliation with a feathered razor, easily removes unwanted peach fuzz, while refreshing the appearance of skin tone and texture by removing dead skin cells. Treatment is finished with ZO ® Skin Ossential ® Brightening Masque. Brightening & Hydration Facial: Targets pigment related issues to help even skins tone and texture with ZO Ossential Stimulator Peel. Combined with ultra hydration to address dry, dehydrated skin, it is completed with DNA repairing enzymes, Growth Factor serum, and Renewal Crème. Acne & Oil Control Facial: Providing a solution for acne with impurity extractions, opens and deeply cleanses the pores with Sulfur Masque, calms irritated skin and encourages cellular turnover with a ZO Ossential Stimulator Peel. ZO® 3 - Step Peel™: A varying depth peel that specifically targets many signs of skin aging, ideal for treating Melasma, sun damage, fine lines, uneven texture, large pores, dull skin, and even acne. This peel requires pre-conditioning treatment and is customized to individual skin types. * All treatments are customized to the client and altered to fit their skin health needs. Most people are born with healthy, unflawed skin, but life takes its toll on your appearance. The natural aging process, environmental conditions, internal health, and genetic factors can lead to skin that’s dull, sagging, dry, thin, and wrinkled. ZO skin care products are scientifically formulated to fight the factors that lead to less than healthy skin. The products are only available from certified providers like Jill Girany. 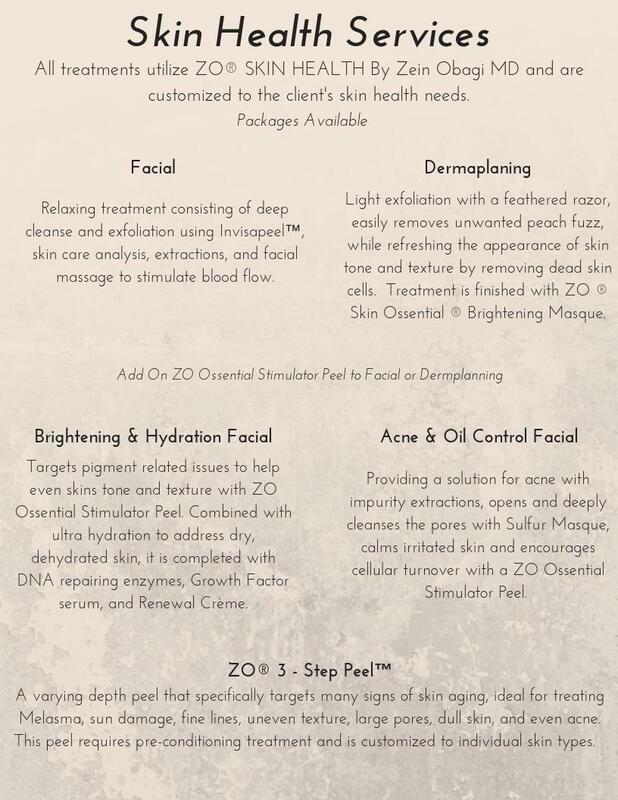 All ZO products seek to provide you with optimal skin health. They do so by restoring smoothness and tone. They also hydrate your skin thoroughly and improve circulation. ZO products regulate skin cellular functions, meaning you produce more collagen and elastin, which are skin firming compounds, and turn over old cells to reveal new, healthy cells more efficiently than you might without treatment. Which ZO products are available? At-home treatment products and professional-level treatment products available only from Jill Girany are also among the offerings. Which ZO products are only available in-office? Jill Girany offers various chemical peels that are only available via prescription. A chemical peel involves applying a solution to your skin that causes it to slough off old cells and reveals fresh, new layers. She does a thorough analysis of your skin and your aesthetic goals before offering these customized treatments, which have dramatic results. With chemical peels, you achieve maximal skin tightening and anti-inflammatory benefits. Peels can reduce the appearance of brown spots, treat acne, minimize fine lines, and eradicate dullness. The peels cleanse, extract, and smooth skin texture and tone. The prescription level serums Jill Girany applies following the peels thoroughly hydrate and nourish your skin, creating an instantly gratifying glow. What is a ZO 3-Step Peel™? The ZO 3-Step Peel is offered in the offices of AgeLess Medical, but you’re given at-home treatments to complement the procedure and continue the results that combat the signs of aging and skin discoloration. The peel uses a blend of exfoliants, retinol, and multi-action agents to improve your skin’s health. It also provides antioxidant protection to treat many negative signs of aging. To learn more about how chemical peels can help improve the appearance of your skin, call AgeLess Medical or book an appointment online today. Also can we please add a new service of Sculptra? Do you have information regarding this treatment or will we need to provide information to you? To learn how you can achieve healthier, brighter looking skin with ZO Skin Health products, call AgeLess Medical or book an appointment online today.